We are indulged in providing Coffin Funeral Boxes to our clients. Our Boxes are widely appreciated by our customers for its design and durability. Our range of coffin boxes are developed keeping in mind various body sizes and shapes. They can be used for burying the body and for safely transporting human remains across countries and borders. They are strong enough to transport the body by any means; be it road or air. 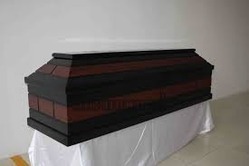 Ordinary and special kinds of coffins are available as per demand. Specialization in manufacturing unit: We manufacture coffin boxes in our workshop & same are manufactured & design by the competent & perfect designers & workers. The coffin boxes may also be designed,manufactured & supplied to the users in bulk on placing the demand in advance.